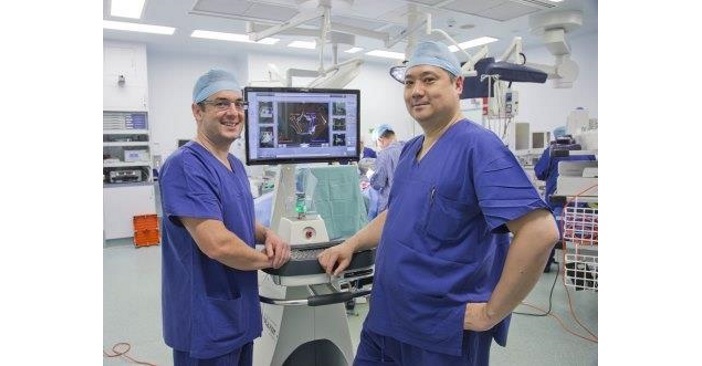 In a Southern Hemisphere first, leading Australian orthopaedic and neurosurgeons have collaborated to perform the first spinal surgery using state-of-the- art robotic technology. The new technology, Renaissance, is available to patients who require spinal fusion surgery – a procedure performed on approximately 100 Australians with degenerative or traumatic spinal conditions each week. Australia’s first Renaissance surgery was conducted at Sydney’s North Shore Private Hospital by Dr Jonathon Ball and Dr Brian Hsu. The new procedure is made available thanks to the shared vision of the two surgeons – marking the first time a local neurosurgeon and orthopaedic surgeon have collaborated on such a project. Both surgeons attended the Spine Society of Australia’s 25th Annual Scientific Meeting held at the Brisbane Convention and Exhibition Centre in April. At this meeting, international guest Dr Raymund Woo, medical director of the Pediatric Orthopaedic Program at Florida Hospital for Children, presented his experience on using the Renaissance technology. Renaissance is transforming spinal surgery from freehand operations to highly accurate, leading-edge procedures, meaning patients experience less post-operative pain, lower complication rates and faster recovery times. It allows surgeons the freedom to pre-operatively plan surgery in a virtual 3D environment and actively guides them during the procedure, allowing for much greater precision than conventional surgeries. The robotic technology has been shown to reduce the average length of hospital stay by 27 per cent, reduce patient complications by 48 per cent, improve implant accuracy by 70 per cent and reduce x-ray dosage by 56 per cent. Severe, chronic back problems often lead to poorer quality of life, psychological distress, mental disorders and disability. Australian health data reveals people with back problems were 1.2 times as likely to report high or very high levels of psychological distress than those without the condition, and 1.7 times as likely to report any mental disorder, such as depression.